Avalanche Awareness 101 - BLBCA at MEC | Backcountry Lodges of B.C. Avalanche Awareness 101 - BLBCA at MEC | Backcountry Lodges of B.C. 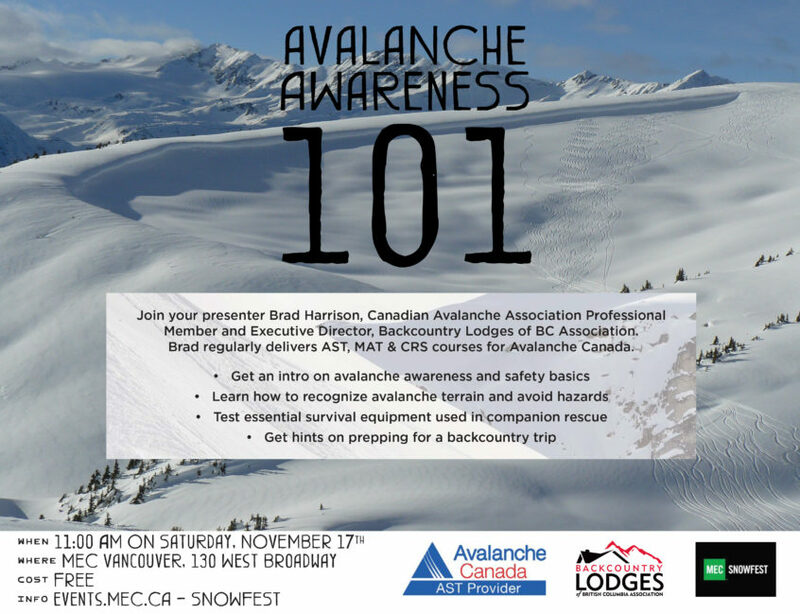 Join presenter Brad Harrison, Canadian Avalanche Association Professional Member and Executive Director, Backcountry Lodges of BC Association. Brad regularly delivers AST, MAT & CRS courses for Avalanche Canada. Join us on Nov 17th at the MEC Vancouver Store. Because you are a backcountry traveler, these are things you need to know. This clinic has been made possible with the support of our sponsor, the Backcountry Lodges of British Columbia Association.